Hi [INSERT YOUR FRIEND'S NAME HERE], Please check this out https://www.proactivehealthcare.co.uk/gut-health/intolerance-complex?referrer=0 and get £4 off your first order (minimum order £30 excl. shipping). Thanks! Food intolerance typically manifests in the digestive tract as occasional diarrhea, cramping, bloating, gas or upsets stomach. In contract to food allergies, the symptoms food intolerance are often delayed and may not occur until several hours or even a day intolerable food is ingested. Identifying the particular food or food groups that cause sensitivity is a primary goal for addressing intolerance. Elimination diets are a common practice but not always possible or practical. Restaurant meals frequently contain ingredients containing gluten, lactose, and other common triggers, Reducing or eliminating trigger foods can be helpful, but dietary modification in combination with enzymes supplementation provides peace of mind and complete digestive support. 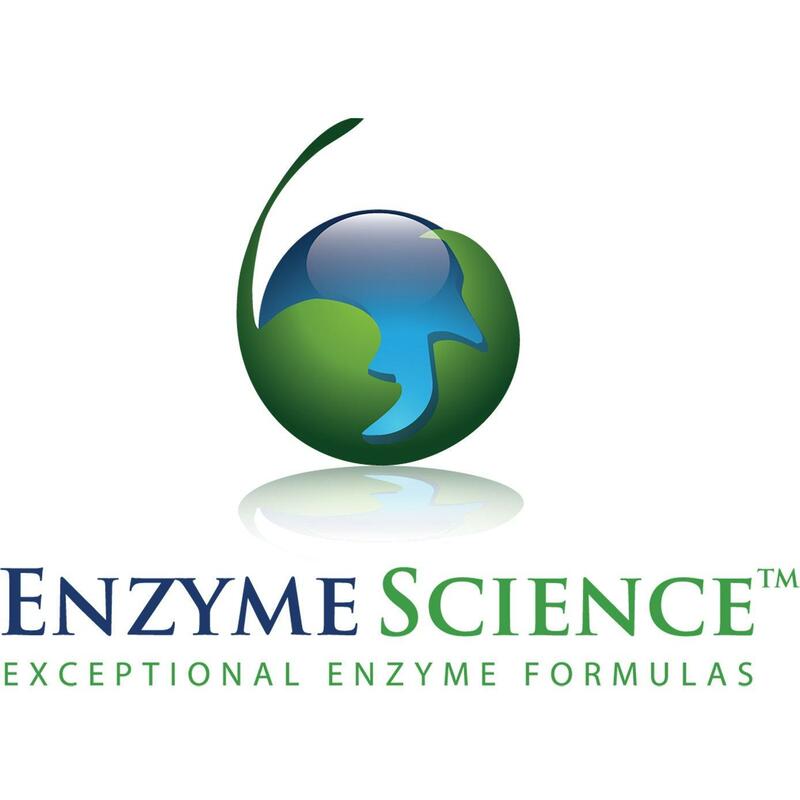 As an alternative to elimination, enzymes supplementation may assist and enhance the digestion of foods, therefore allowing greater availability of nutrients for the body. 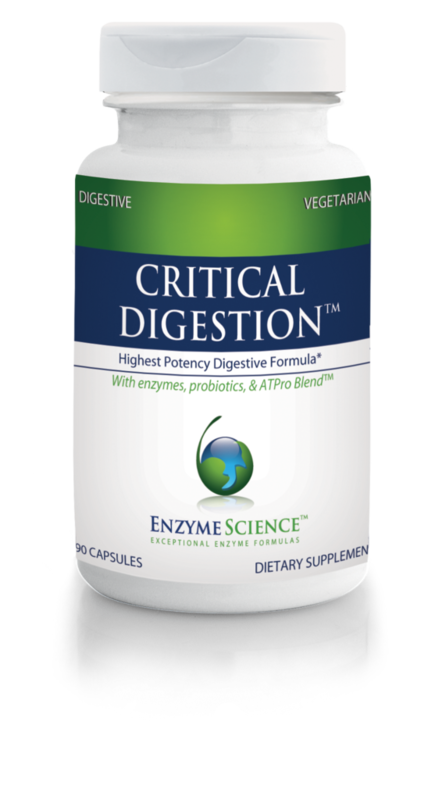 Enzymes are capable of breaking down dietary constituents small enough to minimize encounters of intolerance and maximize absorbability. A full spectrum digestive enzymes formula, such as intolerance Complex, provides support for both more and less common food intolerances. 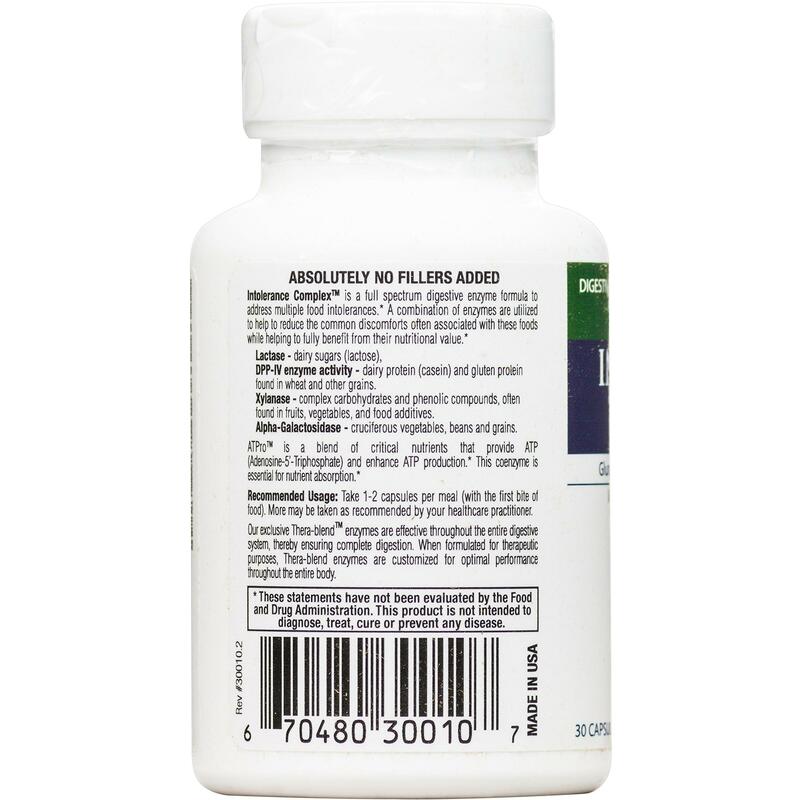 As lactose and gluten intolerance are the most widespread concern, intolerance Complex contains lactase for digesting the dairy sugar Lactose and DPP-IV activity for digesting gluten proteins found in wheat and other grains. 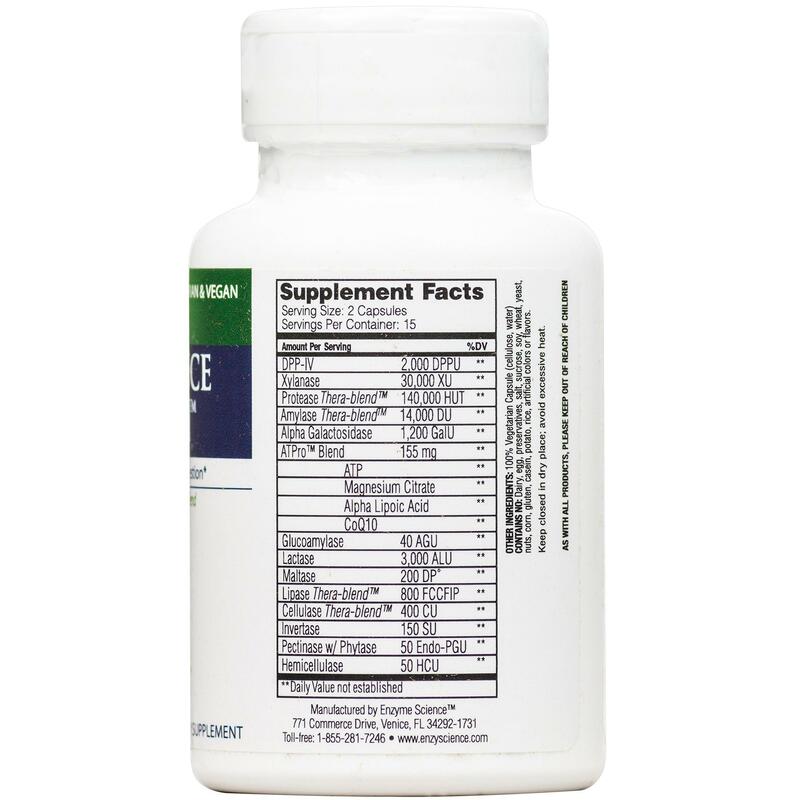 Alpha Galactosidase is included for digesting gas-forming complex starches found in beans, grains and fibrous vegetables. 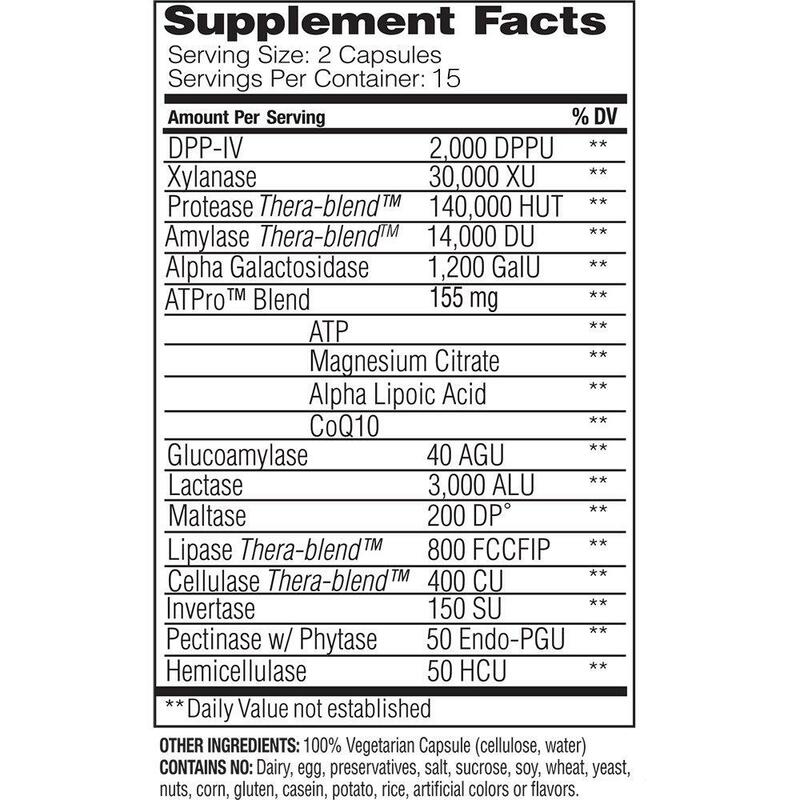 Support for protein, fat and carbohydrate digestion rounds out the formula in order to expand the body?s capacity to liberate nutrients from foods eaten. By doing so, the fuel available for metabolism, repair and cellular health is increased. Adenosine Triphosphate (ATP), produce in every cell, is founded in all raw foods and is the body?s natural source of energy. 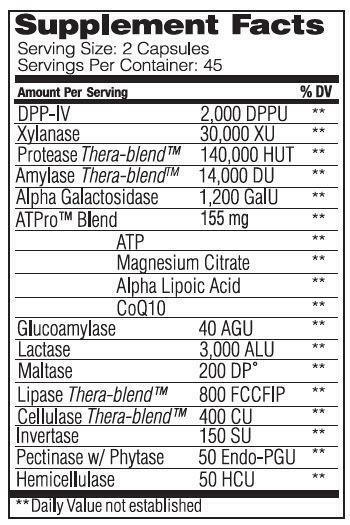 Supplementing with ATP complements a healthy diet by increasing the energy potential of the foods consumed. It is also a primary signaling molecule for healthy digestive processes. One such process is the necessary production of Hydrochloric Acid (HCI) in the stomach, which supports protein digestion. ATP in the intestinal contents also binds to receptors that stimulated proper peristalsis and mucosal integration. Take 1 capsule per meal (first bite of food). More may be taken as recommended by your healthcare practitioner.